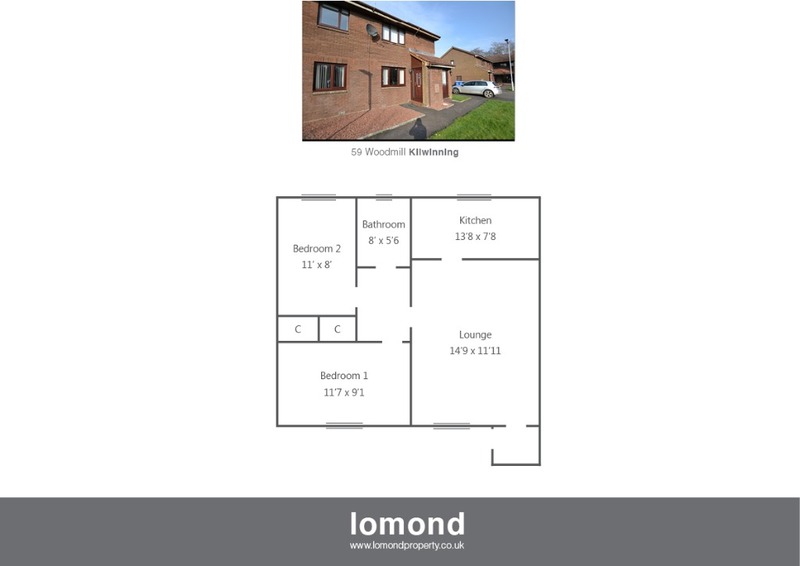 Benefitting from its own front door, 59 Woodmill is a rarely available ground floor flat situated within a popular residential area. The apartment comprises two double bedrooms, lounge, dining kitchen and shower room. The property benefits further from double glazing and an allocated parking space. In summary the property layout extends to an entrance vestibule leading to the front facing spacious lounge. To the rear of the property off the lounge, the dining kitchen comes well stocked with floor and wall mounted units. Both bedrooms are double in size, each with fitted wardrobe space. The shower room features a walk in shower, with WC and WHB. Externally the property is situated on communal grounds. The property benefits from an allocated parking space. Woodmill is an established and popular residential area. Kilwinning town is close by and provides access to a range of amenities including supermarkets, bars, restaurants and town centre shopping. There are a number of local primary and secondary schools within the Kilwinning and Irvine area.